On a sunny April day six years ago during a trail walk, my son told me he was gay. He was 14. Outwardly, I responded calmly with love and words of total acceptance. Inwardly, I was shaken to the core. Not because I objected to the news or doubted his conviction, but because I instantly had to adjust to the shattering of a future I didn’t even know I’d created. One in which my son was safe from ignorance and discrimination. One not filled with continual coming-out conversations for him or for his father and me. But here it was. Despite feeling knocked off balance, I managed to set that aside and focus on my son. What mattered was making sure he felt loved and supported. Whatever was happening to me could be sorted out later. I spent the next week scouring the Internet for information that could help me understand what I was feeling and what my son might be going through. I talked with friends about their coming-out experiences and asked for their advice. Over the following weeks, months and years, our lives expanded. When we let go of unexamined expectations, a bigger world opened up to us. Our little family is closer than I could have hoped. Our son continues to be the absolute joy of our lives, and we are so thankful that we have been given the gift of knowing and loving him completely. Stay focused on the person who has shared this with you. There will be plenty of time later to work through your feelings. It’s OK to ask some basic questions but don’t get more personal than you would have before. Even if the coming out is done casually and you’re perfectly OK with the news, it was still something the person had to verbalize for you to know him or her, so don’t trivialize the moment. Thank them for trusting you and wanting you to know them better. That being said, there’s a difference between a coming-out conversation (a big deal) and accepting people who are open about who they are (simple human kindness). Until our society doesn’t assume everybody is straight, coming out will still be necessary in many situations—and for some, extremely difficult. Call, text, or check in the next day. Their biggest fear may be losing your friendship or love. Communicate the way you’ve always done. Nothing has changed except maybe that you have more information that can potentially deepen your relationship. It’s their journey and it should be on their terms. Honor your loved one’s wishes for openness or confidentiality. In the case of children coming out, support and acceptance are vital. Questioning their orientation after they have decided to come out can feel like a denial of a core facet of who they are. The average age for coming out is now 16 and continues to trend downward, thanks to the support of friends and family and access to information that helps people identify what they are feeling sooner. No matter how prepared or accepting you are, new information about a loved one may make you feel inadequate. If necessary, talk to a counselor about your feelings or reach out for support or do both. Honoring that process allows you to let go of doubts and fears and open up to new possibilities. “A friend of mine came out a few years ago, and it was concurrent with the end of his marriage. He and his ex have done remarkably well with the transition. We have known them and their kids for years, and they’re all doing about like everybody else who gets divorced—good days and bad, highs and lows, but overall well. We still talk about our jobs, having kids in college, what kind of mileage you get and how the recent rain has affected the frequency of mowing. Boring stuff that is the stuff of life, and I think it’s important, dull as it may be, to make sure you include non-drama stuff in your relationship. When you relate to someone that way as opposed to exclusively talking about big issues, it makes it all more normal—which is where I hope we’re heading.” — Dan T.
“It’s always bothered me that anyone who is not heterosexual is supposed to declare their sexuality in a public, dramatic way. I never had to do that! With my niece, it was organic and natural. She talked to her parents and told them she was dating a woman at a sports camp. My sister told me, and I talked to my teenagers, for whom it was no big deal. When I met the girlfriend, it was totally casual and friendly.” — Laurie M.
“I can’t say I ever did anything super special, but I did say ‘thank you’ to both friends who came out to me. I wanted them to know I appreciated that they trusted me and cared about our relationship enough to share that information, and I wanted to make sure they knew I supported them 100%. I sent one of my close college friends a card after she came out to me. I went out to gay bars with another friend as she got more comfortable with being out. (I know, huge sacrifice, drinking beer with a friend.) Just being there in general helped show support to that friend, because she didn’t have a whole lot of people in her life at that time.” — Parker W.
“Just listen. It seems easy enough, but lending your ear is one of the biggest things you can do. And while you may have encountered others in your lifetime who have come out in this way, remember that everyone is different. Every coming out experience is different, and each one presents its own unique challenges. Leave room for your loved one to define that experience by simply listening, without judgment. And join a support group. Groups like PFLAG (Parents, Families and Friends of Lesbians and Gays) can be invaluable. They provide the resources to better support your loved one as well as the larger gay, lesbian and transgender community as a whole—everything from up-to-date legislative issues that affect the gay community to dealing with coming out in the workplace.” — Cat S.
“To be the ally of someone who is struggling with his or her sexual orientation, we have to be genuinely supportive and affirming. And when someone reaches out and entrusts a piece of their personal life to us, we have to know the weight and worth of that. We might be the only person delivering the important message that they are loved, they are worth it and they are just like everybody else, even if they don’t feel that way. 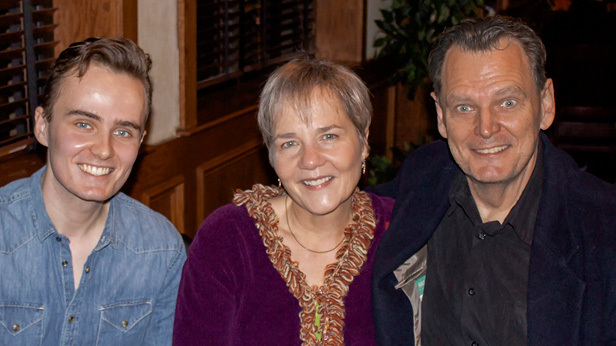 It’s with hope and help from the allies in our lives that it truly does get better.” — Carolina F.
Lisa, with her son Patrick and husband Ben, in a family photo taken in December 2014. To our LGBT friends and all who love and support them, we welcome you to Hallmark’s online resource page. As it has done for more than 100 years, Hallmark is here to help express love, encouragement, joy and acceptance. We hope to provide you with the tools, advice and information you need to nurture and affirm all your unique and treasured relationships. Lisa Riggin has a cool job in writing at Hallmark and off-site gigs as mother, wife and cat wrangler. During off hours, you'll likely find her on her bike or combing the neighbors' yards for medicinal plants to make herbal balms.